The geology and soils of the Triassic basins of North Carolina present significant difficulties to residents who do not have access to a public water supply and sewage system. Water well yields are typically very low, and many dry holes have been drilled. At many Triassic sites, the soil does not perform adequately during percolation tests for septic drain fields. If you live in or are considering a property purchase in a Triassic basin, it would be most prudent to ensure that you have acceptable water and septic performance. Where are the Triassic basins? There are three Triassic basins in North Carolina: the Dan River basin, the Davie County basin, and the Deep River basin. Of these, the Deep River basin is by far the largest, and includes portions of 11 counties (Anson, Chatham, Durham, Granville, Lee, Montgomery, Moore, Orange, Richmond, Union, and Wake). The Dan River basin is located in Rockingham and Stokes Counties, and the tiny Davie basin lies in Davie and Yadkin Counties. Map showing approximate extent of Triassic basins in North Carolina. The Triassic basins are underlain by sedimentary rocks, mainly sandstone and siltstone that are very clay rich and poorly sorted. This means that there is little pore space to hold water, and also that the water that is held in these rocks cannot migrate easily. Likewise, the soil formed from these rocks does not readily transmit or soak up water. A second rock type commonly occurs in the Triassic basins. It is an igneous rock called diabase that is Jurassic in age, younger than the Triassic sedimentary rocks. 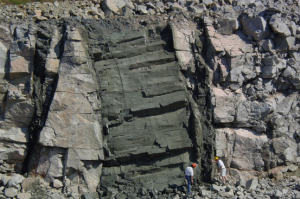 Diabase typically occurs in narrow, nearly vertical sheets (dikes) that can be seen to cut across the older rocks. Over long periods of time, as these diabase dikes weather, they leave hard blocky or rounded boulders on the ground. Photograph of diabase dike exposed in quarry wall. Photograph of partially rounded boulder of diabase weathered out of a dike. Diabase dikes make good targets for drilling of water wells. Investigate the geology of your property to see if there are diabase dikes. 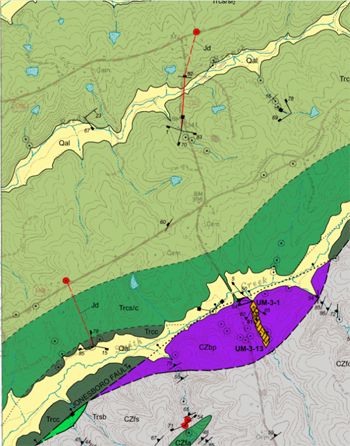 If there is a geological map for your area, you can consult one that may be available from the North Carolina Geological Survey (https://deq.nc.gov/about/divisions/energy-mineral-land-resources/north-carolina-geological-survey/ncgs-publications). However, be aware that many existing dikes may not appear on the map due to the scale of the mapping. For example, the map below on the left shows a portion of an existing geological map. Diabase dikes are shown as red lines. NC Geological Survey 1:24,000-scale map of study area. Same map area after property specific detailed investigations. For comparison, on the right is the same area after more detailed study. Professional geologists or geophysicists may be consulted to search for diabase dikes or other geological features that might offer a more favorable drilling target than the typical Triassic sedimentary rocks. 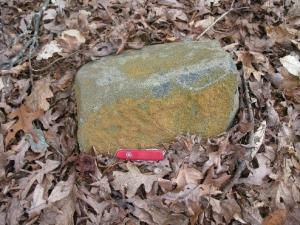 Because diabase is a relatively magnetic rock type, such an investigation may involve a magnetic survey.